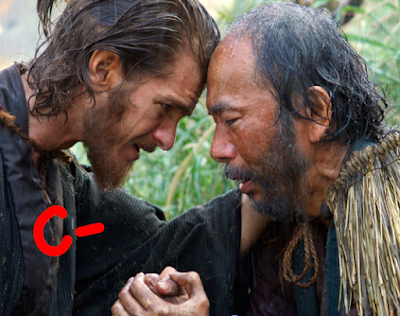 Martin Scorsese’s new film Silence you probably won't go home talking about. It has none of the pizaz and flare of a great many of his other works, but it sure as hell tries hard. The film, which Scorsese refers to as his "obsession," is the culmination of some 27 years of work. It is brought down to scale in this 159-minute film. Scorsese may or may not be hoping for an Oscar from it, for which Scorsese has been nominated at least a dozen times in the past and won once for his The Departed in 2007. Silence is based on a 1966 novel bearing the same name by a Japanese author named Shusaku Endo. It is based on historical events and takes place in the 17th-century. It brings us the story of two Portuguese Jesuit missionaries, "Rodrigues" (Andrew Garfield) and "Garrpe" (Adam Driver). 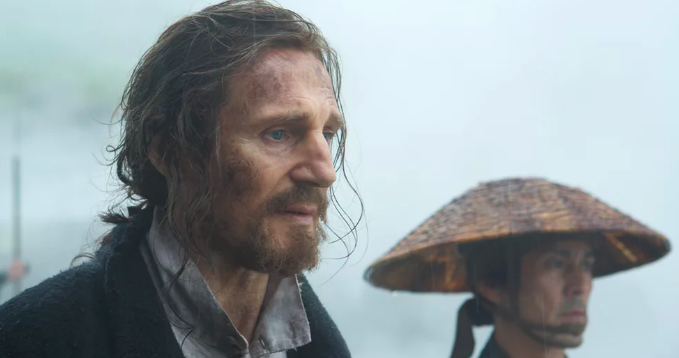 They travel to Japan to track down their mentor, "Father Ferreira" (Liam Neeson) who reportedly has defected from the faith and is living as a Japanese. During this time, Christianity was banned in Japan. True to the history of the time period (circa 1640 CE), tens of thousands of Japanese Christians were persecuted and killed. In Silence, the two determined priests find themselves in the same situation as Ferreira. Rodrigues and Garrpe are forced to choose between apostasy and death. Many prayers are said for guidance, but God remains "silent" all the while. While the film may be long, it is seldom lacking in displays of cruelty and heartlessness for which we humans have been and are known. 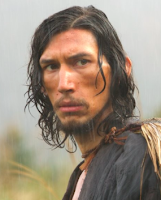 At the beginning of the film (up through the first half), we are bombarded with shows of what Christianity was doing for the in-hiding Christians that Rodrigues and Garrpe visit as they hunt for Ferreira. The two young men of God seem eager to lift the burdens of sin. And yet, by the film's end, we hear a renunciation of this idea. Why? Because the Japanese were never converted to Christianity in the first place since their animistic naturalism cannot permit belief in a "Son of God" (only a "sun of god"). The proposed suggestion wants to debate this concept, but the film is too shallow and only the adaptation of a novel, the obsession of which is the only thing driving it--that and Scorsese's own disappointment in there being no divine voice in his youth when he, too, was steeped in faith and considered the priesthood. I sympathize. Scorsese said he first read Endo’s novel back in 1989. He quickly became enthralled by it. Whether or not you, dear reader, will become enthralled with the film it is an entirely different matter. The flick has Christian themes in abundance, but this is the sort of movie that will appeal neither to the religious (because of the ending - and because the doctrinal aspect of things isn't deep enough), nor to the masses at large (since the film is entirely de-motivational). Scorsese really loved his project here. You can tell he loved it from the ridiculous amounts of detail he puts into the characters, the settings and background, and the way in which the film explores the volatile atmosphere of the time. Other characters, like a nameless interpreter played by Tadanobu Asano, give this a human element that makes us want to find a reason to like it. The film will take a viewer from careless and apathetic, to intrigued and shocked in, well, longer-than-expected intervals. But even if you do keep watching and make it to the end, the fact remains that Silence was never a movie-worthy concept. It just wasn't. It was merely an exacerbation - a passionate pet project, really - of Scorsese's unhealthy mind, the end product of violated trust.